This tutorial demonstrates how to use the PGP Module Steps	in Decisions, (Pretty Good Privacy). ThePGP Module	is an encryption program that provides cryptographic privacy and authentication for data communication. PGP	is often used for signing, encrypting and decrypting texts, emails, files, directories, and whole disk partitions. It can also be used to increase the security of email communications. PGP	can be used to send messages confidentially. The PGP module steps	combinesymmetric key encryption	and public key encryption. The message is encrypted using a symmetric encryption algorithm. This symmetric encryption algorithm requires a symmetric key	. Each symmetric key	or session key	is used only once. The message and itssession key	are sent to the receiver. The session key	must be sent to the receiver so that they know how to decrypt the message. The message is protected during transmission by encrypting the receivers public key. The encrypted key can only be decrypted with the symmetric key (session key). Note:	This Module must be installed before it is available within Decisions. Links are attached at the bottom of the page. Note:	PGP Module	in Decisions	cannot be used to generate PGP	public and private keys. 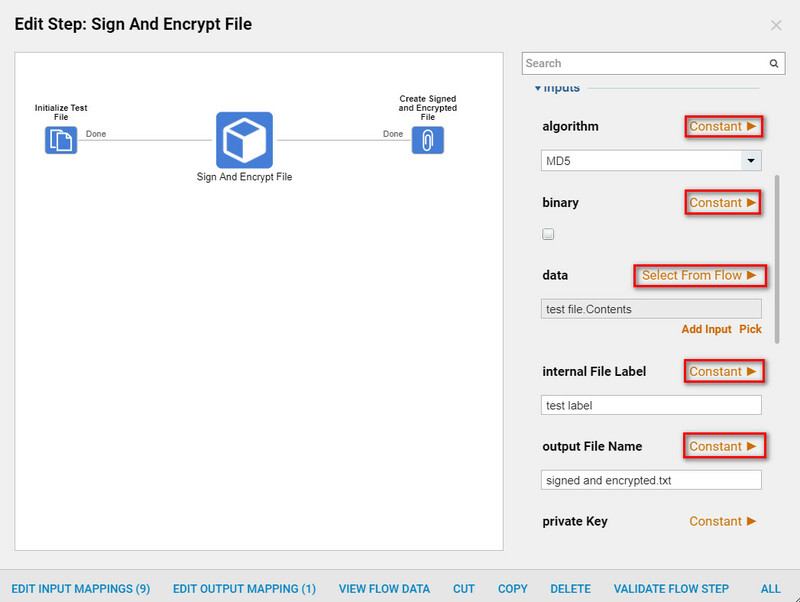 PGP Module	may be used for building workflows to encrypt or decrypt messages or files. Therefore, public and private key for PGP	steps in Decisions	should be generated with third-party systems. ThePGP Module	Steps can digitally sign a file. This module can verify that a message is authentic. A User signs it with a private key and then verify the files with a signature. The PGP Module	steps include eight different steps that enable the designer to encrypt, decrypt and sign files. This document describes each step and how to configure it. Public Key:	locks the message and converts the key into an encrypted file. Private Key:	Unlocks the encrypted file key and converts the message back into plain text. Clear Sign File -	Digitally signs a file using a private key, but keeps the file contents in plain text. Decrypt File	- Uses a private key to convert an encrypted file into plain text. Decrypt String	- Uses a private key to convert an encrypted string into plain text. Encrypt File	- Uses a public key to convert a plain text file into an encrypted file. Encrypt String -	Uses a public key to encrypt a plain text string. 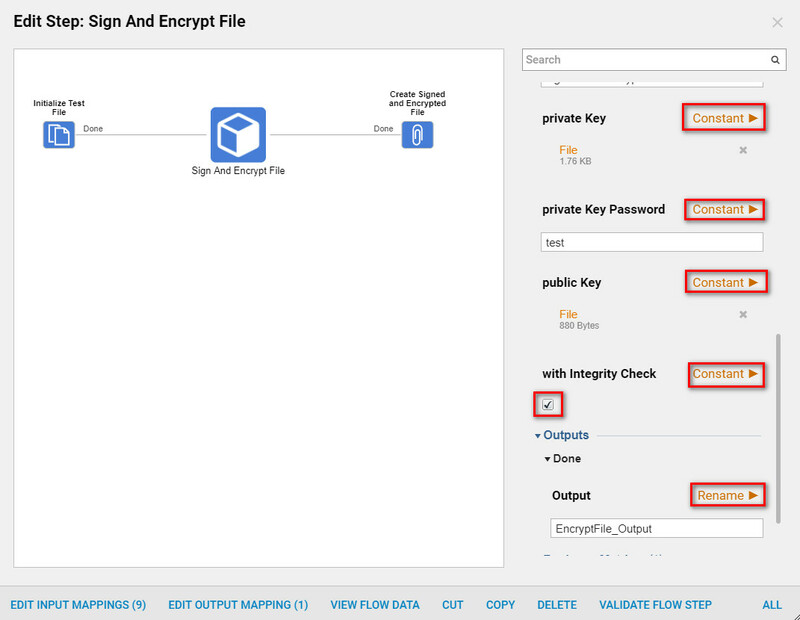 Sign and Encrypt File -	Uses a private key to digitally sign a file and a public key to encrypt it. 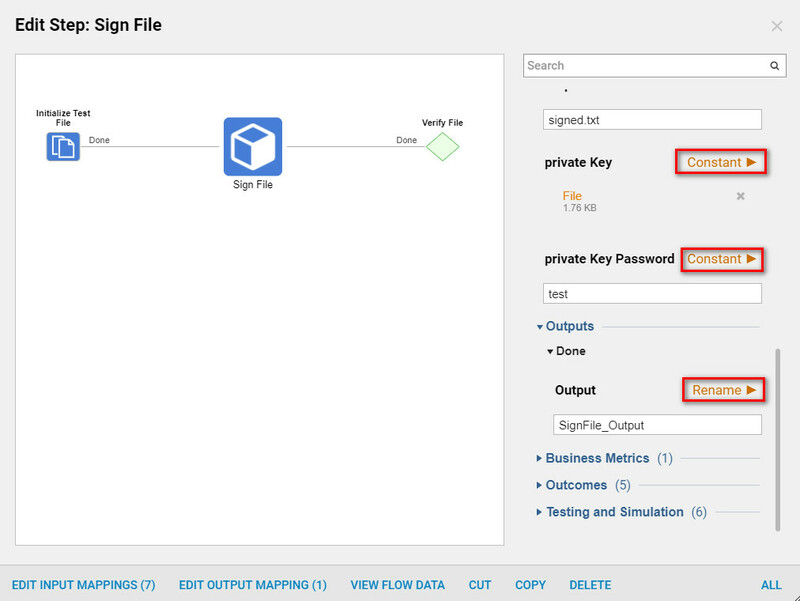 Sign File	- Uses a private key to digitally sign a file. The file is not in plain text so a decrypt file step is needed to read it. Verify File	- Uses a public key to verify the digital signature on a file is authentic. In the figures following, the PGP Module Steps	are described in more detail and an example of the steps settings is explained. 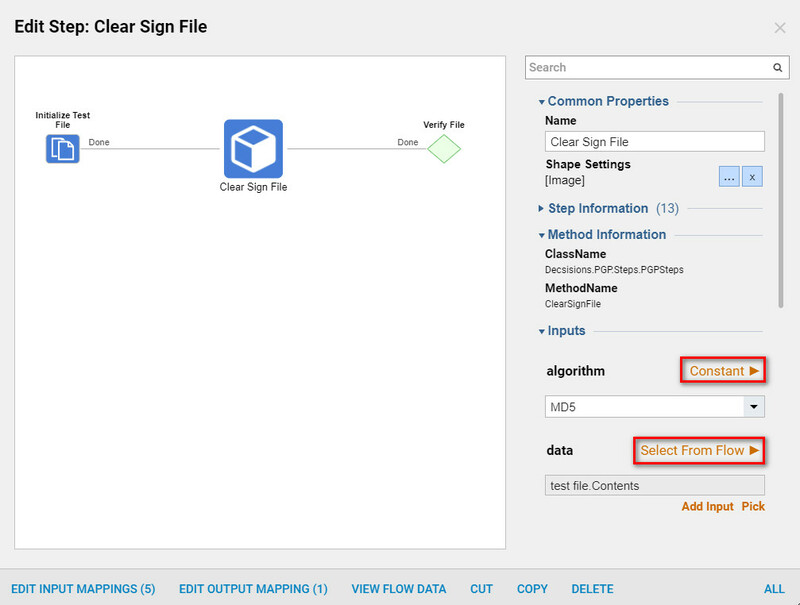 On the Clear Sign File Step,	the algorithm input creates a signature. The Inputs provide options to input data and upload aprivate key). The image displays how this step is used in a flow. Part 2: On the Clear Sign File	next to Output File Name	choose Constant	enter the Output File Name	(clear signed.txt). Next, to private Key Password	choose Constant	and enter the key in the text box, (Figure 20). ThisDecrypt File Step	takes in the encrypted file output and uses theprivate key password	to unlock the private key. 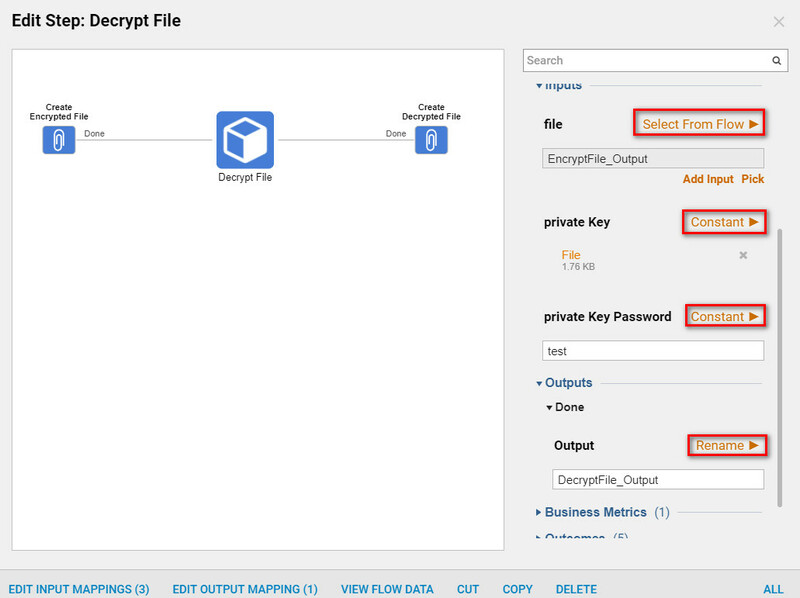 The Decrypt File step	then uses theprivate key	to decrypt the encrypted file. The private key	has already been uploaded as a constant on this step. Now that theprivate key password	and theprivate key	have been unlocked the decrypted file will now output the File. 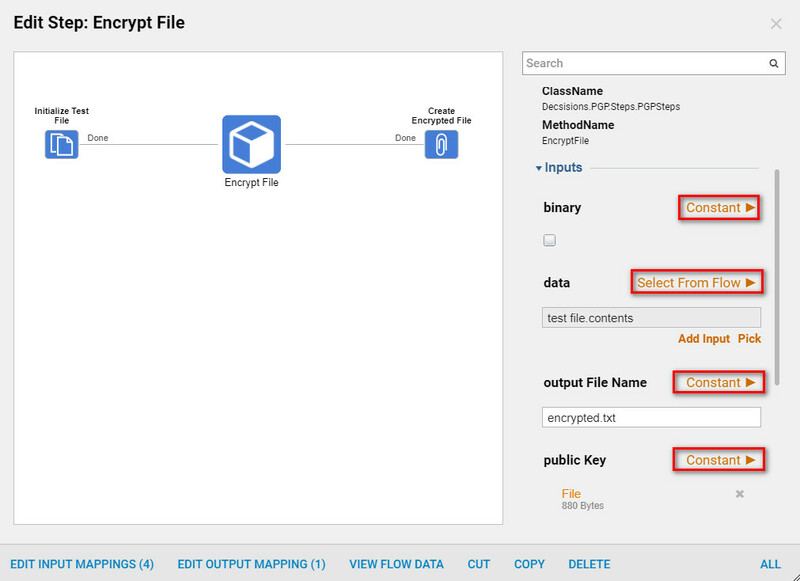 On the Decrypt File Step	in the Inputs	section next to file	choose Select From Flow	and pick the Encrypt Files Output	(Figure 4). The Decrypt String Step	takes in the data from theEncrypted String	output and uses the private Key Password	to unlock theprivate key string	. After the private key	is unlocked the message is decrypted into a string using plain text. On the Decrypt String	in the Inputs	section next to data, choose Select From Flow. Choose the output from the Encrypt String Step	. Next, to thePrivate Key Password	select Constant	and enter theprivate key	. This example uses the word "test"	. Next, toPrivate Key String	chooseMerge Plain Text,	selectShow Editor	to view the string. The image below shows a Merge Text Editor	with the unlockedPrivate Key String. Decrypt String (Private Key String) -	After Show Editor	is selected, the Merge Text Editor	will show and display the private key	(test) as astring,. 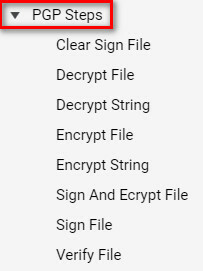 TheEncrypt File Step	takes indata contents	and encrypts the message. Use the public Key	option to assign the encrypted message a public Key	. On the Encrypt next to public Key,	set it as a Constant	to upload a file. On the Encrypt File	step in the Inputs	section, next to binary	select Constant. Next to data choose Select From Flow. 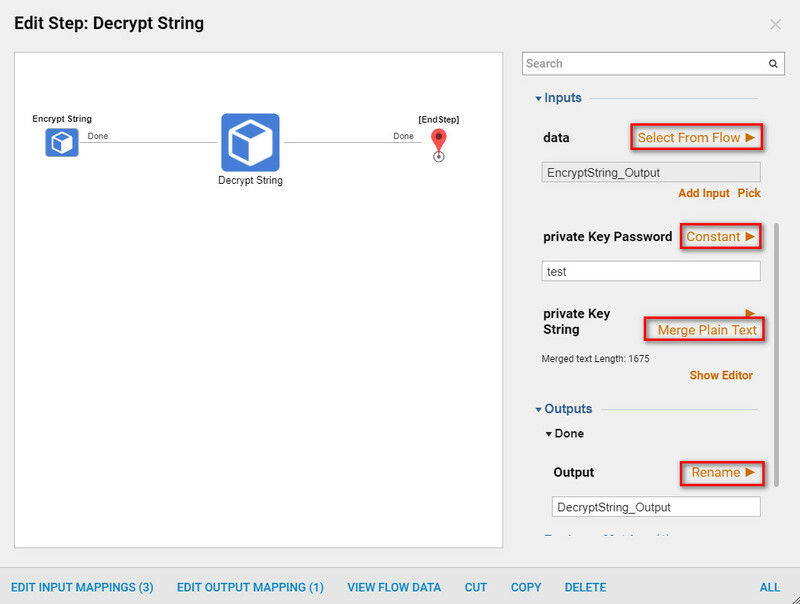 The Encrypt Step	takes in data and encrypts the data into a string with apublic Key String. The step allows you to view the public Key String	in plain text. 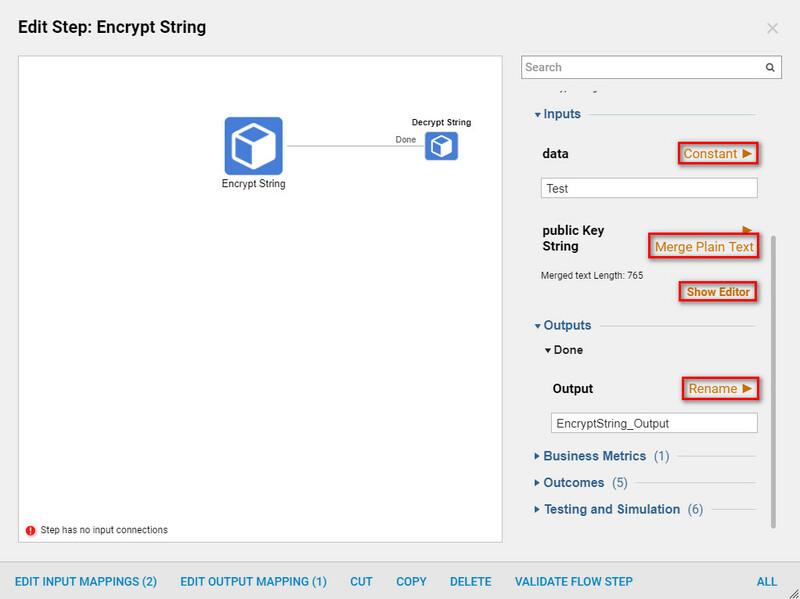 On the Encrypt String	step set the data	to Constant	and give theinput	data a name (Test). Next to Public Key String	set the type toMerge Plain Text	and then selectShow Editor. TheShow Editor	text box will have an encrypted string for thedata name	(Test). The output will be defaulted toRename	and already have an output name in the text box. After the Show Editor	is selected the Public Key string	will show in the Merge Text Editor. On theSign and Encrypt File Step	in theinputs	section next toalgorithms	choose Constant	and select the algorithm type from the drop-down. Next to binary	choose Constant	and leave the checkbox empty. 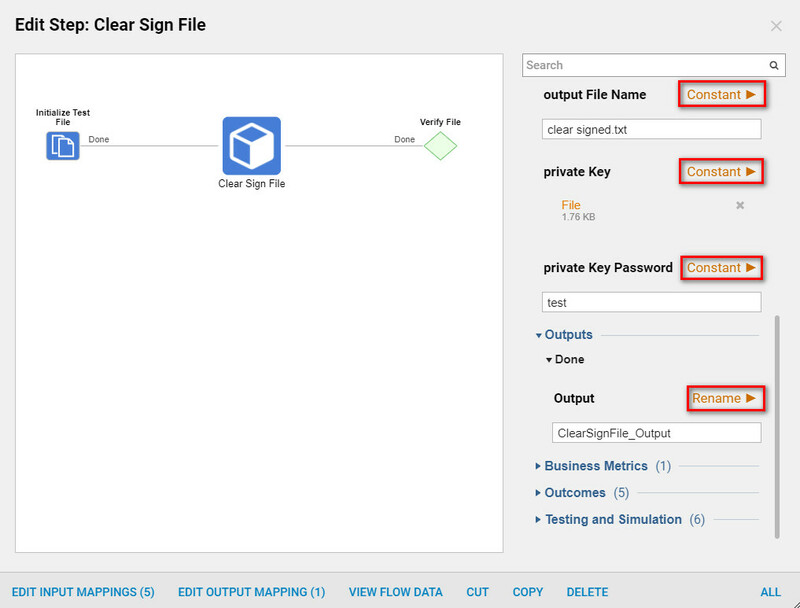 Next to data	choose Select From Flow	and pick (the test file contents)	. Next to internal File Label	choose Constant	and enter (test label). 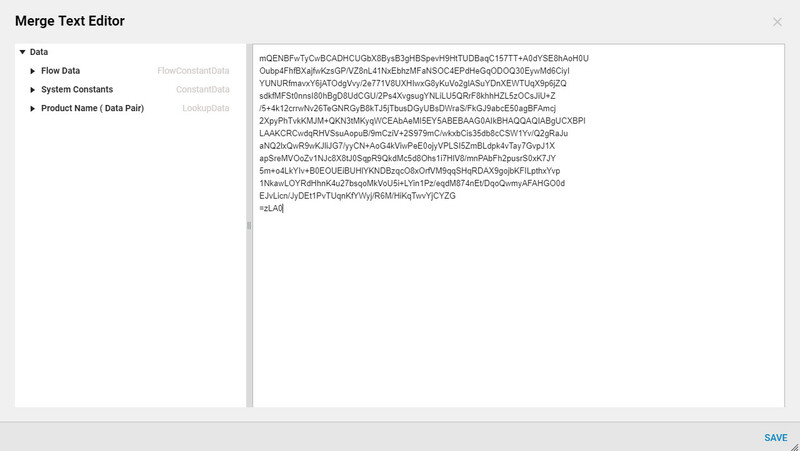 Finally next to Output File Name	choose Constant	and enter signed and encrypted. txt. Continue onto the Sign and Encrypt File Step	to Private Key	choose Constant	and upload your key. Next to Private Key Password	choose Constant	and enter theprivate Key password	(test). Next topublic Key	select Constant. Next towith Integrity Check	chooseConstant	andcheck the checkbox. In theOutput	section next to outputs chooseRename	and make sure or add the Encrypt File_Output string. The Sign File Step	uses a private key	to digitally sign a file. This Step outputs a signed text file and then a Decrypt File Step	is needed to decrypt and read the file. On theSign File	step next to private key	choose Constant	. Next, toprivate Key Password	chooseConstant	and enter the Key	in the text box. 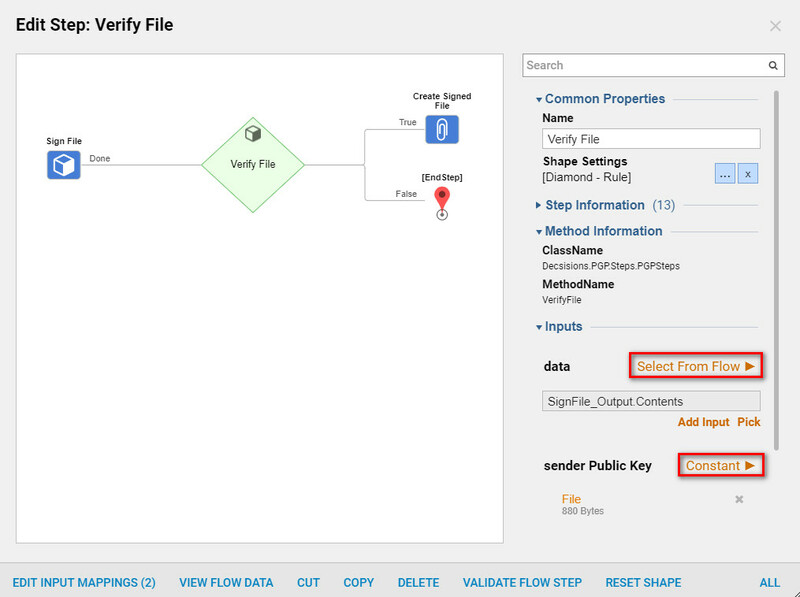 The Verify File Step takes in the output data and then uses the public key to verify that the digital signature is authentic. 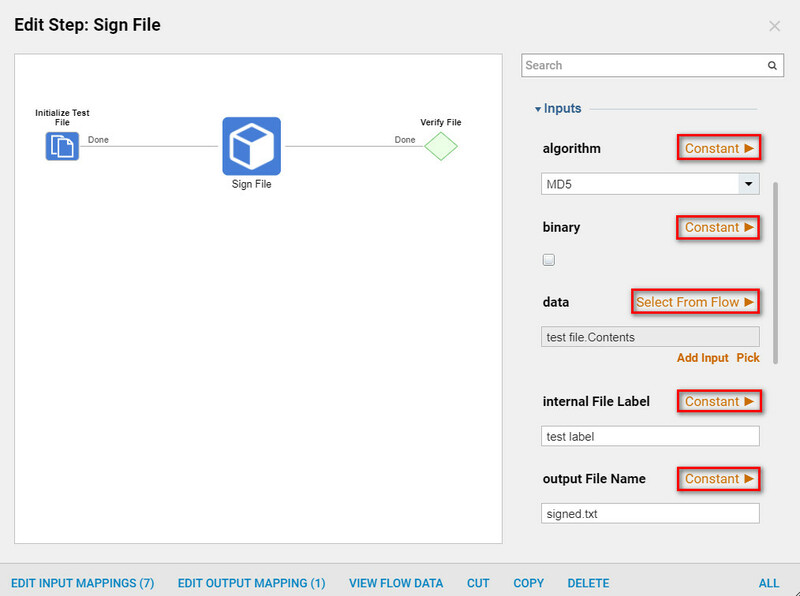 On the Verify File Step	in the Inputs	section next to data	chooseSelect From Flow	and pick theSignFile Output	Contents. Next, to sender Public Key	choose Constant	and add the File.